Note: If you are a student at UMass-Amherst, please order through Collective Copies/Levellers Press (link here), or you may want to purchase a copy at Collective Copies at 71 S. Pleasant St. in Amherst. If you order through Dollars & Sense, there may be significant delays. 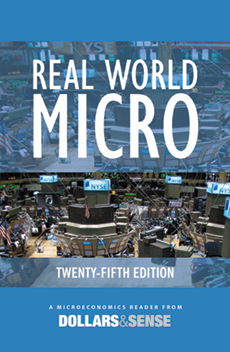 Real World Micro is a great supplement to any mainstream introductory textbook. In addition to presenting alternative perspectives on the basics—supply and demand, production and consumption decisions, market structure and monopoly, market failure and the roles of government—the new 25th edition relates theoretical principles to current controversies about income distribution, environmental protection, taxes, labor, trade, and (in a concluding "Policy Spotlight" chapter) deindustrialization. Organized to follow the outline of a standard economics text, the book includes a brief introduction for each chapter, including discussion questions for all articles, to help students relate the articles to the theories in standard textbooks. Its contents provide vivid, real-world illustrations of key economic concepts. Real World Micro’s well-researched, readable articles are drawn from the pages of Dollars & Sense, the leading magazine of popular economics. Please click on the "Table of Contents" tab above to see the newly published 24th edition.